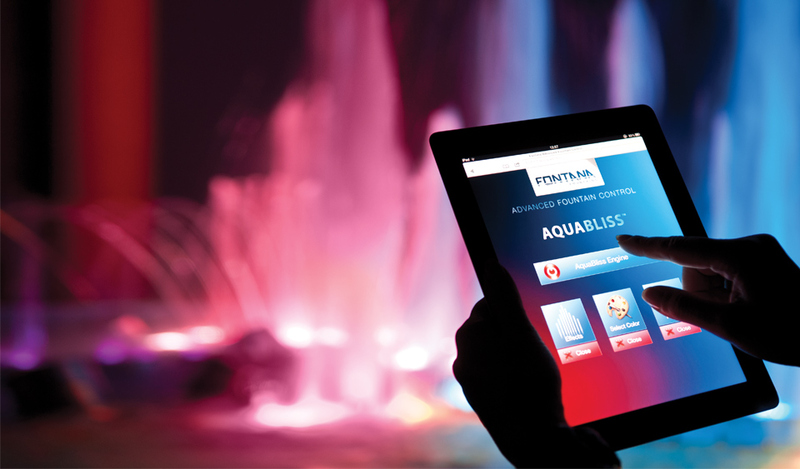 The iPad is the epitome of advanced technology of the 21st century and fontana advanced fountain control is a masterpiece of Technology, Inspiration and engineering. It essentially gives you functionality in a way that reaches the margins of magic. With the Fontana Advanced Fountain Control, apart from completely automated operation, you can take over control. You can trigger specific water shapes or entire choreographies, set the fountain’s height in your desired level, start light shows, make the fountain’s color match your mood, divide the fountain in areas with individual control, access pre-programmed water effects, change the playing choreography on the fly — you can interact with virtually anything in your fountain holding a stylish, state-of-the-art iPad. What originally started as our own showroom’s renovation main idea, became eventually a break-through innovation for the entire fountain industry. Get rid of cables, get rid of old-fashioned control panels and control rooms, play with your fountain like never before. Wirelessly. You can now interact and engage others too. Absolutely safely. Both for people and for the fountain’s infrastructure as well. All vital parts of the control system of the fountain are situated in a totally safe and protected environment, inside the main control panel, where the heart of the Fontana Advanced Fountain Control (FAFC) is also located, directing every action and feature of the fountain. The iPad is essentially the end-user interface to interact with the core -a masterpiece of electronics engineering by itself- and it does it in an often described as magical way. The interaction is made through the amazing, multi-touch iPad’s display, which wirelessly communicates with the core. In addition to the pre-defined security levels, no sensitive information are stored in the device or communicated through the wireless connection, making the FAFC a bullet-proof control system. Even visitors of a show can engage actively with the fountain without being able to cause any kind of malfunction.